For the first time since 2010, a sitting Minnesota district court judge was defeated on Nov. 6 in a bid for re-election. G. Tony Atwal, the incumbent Ramsey County District Court judge whose term was rocked in January by his second DWI conviction since 2007, lost to P. Paul Yang. The judge-elect is a solo St. Paul criminal defense attorney and part-time assistant 1st Judicial District public defender. Yang rang up 9,794 more votes than Atwal on Tuesday, winning 52.73 percent to 46.78 percent. That was a sharp turnaround from the August primary race, where Atwal finished first with 42.32 percent to Yang’s 32.02 percent. A third candidate, Elliott Nickell, tallied 26.65 percent of that primary race. The Yang-Atwal general election match-up was one of five contested state district court elections on Tuesday. In three of them, incumbents won easily. There was a surprise, however, in the race to fill retiring Ramsey County Judge Gary Bastian’s open seat. There, Hennepin County Public Defender Adam Yang beat Scott Flaherty, a shareholder at Briggs and Morgan. Well-known in the legal community, Flaherty was a member of the legal team that successfully defended Gov. Mark Dayton in 2017 after he was sued by state legislative leaders. David Schultz, the Hamline University political science professor and attorney, called that result an upset. Early signs were in Flaherty’s favor. He outpaced a four-contestant field in the August primary—though his victory there was narrower than Atwal’s. Flaherty won 38.13 percent to Yang’s 33.39 percent in August. Two other primary challengers, Jeffry Martin (17.49 percent) and Gregory J. Egan IV (11.00 percent) finished well behind. Erick Kaardal, the government watchdog attorney and longtime political observer, called the Yangs’ ascent to the bench a sign of progress. Not only does it add to the bench’s diversity—both men are from the Hmong community—it also adds criminal defense experience to the court, Kaardal said. In Ramsey County’s other three contested 2nd Judicial District races, incumbents DeAnne Hilgers, Robyn Millenacker and Elena L. Ostby all easily won re-election. Millenacker bested challenger Marcus L. Almon, 69.27 percent to 30.31 percent. Hilgers defeated Thomas Andrew Handley Jr., 70.64 percent to 28.93 percent. Ostby outpaced Calandra Revering 68.17 percent to 31.36 percent. In the seven-county 1st Judicial District, Judge Arlene M. Asencio Perkkio faced a mildly competitive challenge from Marty Judge, a personal injury and criminal defense attorney. Perkkio, chambered in Dakota County, won that race 57.57 percent to 42.16 percent. The last sitting Minnesota district court judge to lose a contested election was Timothy L. Blakely in 2010. Blakely, a Goodhue County judge, was suspended without pay for six months in 2009 after referring divorce cases to a St. Paul law firm to which he was in debt following his divorce. In exchange for referrals, Blakely got a discount on still-owed divorce fees. One year later, challenger Larry Clark took Blakely’s district court seat with 56.4 percent of the vote. Clark remains a judge. Elsewhere on the ballot, associate state Supreme Court Justice Margaret Chutich won her race against Michelle MacDonald. It was MacDonald’s third consecutive bid for the state’s highest court. Though a losing effort, MacDonald once again racked up an impressive number of votes against an incumbent. Her 43.75 percent tally Tuesday approached her high-water mark from 2014, when she scored 46.54 percent of the vote against David Lillehaug. Though Chutich’s victory was never really in question, Schultz said that MacDonald’s strong showing is startling considering that her time in the spotlight so often has involved controversy. MacDonald was suspended from practicing law for 60 days in January and placed on two years’ probation because of her conflicts with a judge during a parental rights case. MacDonald was briefly jailed during that scrap. Currently, she is embroiled in a defamation lawsuit that she filed against blogger Michael Brodkorb. Schultz thinks MacDonald continues to score high at the polling place because her multiple candidacies—and possibly even her legal kerfuffles—have generated strong name recognition. In the only other contested judicial election, Minnesota Court of Appeals Judge Lucinda Jesson comfortably defended her seat, beating challenger Anthony L. Brown, 62.69 percent to 36.96 percent. Adam Yang credits his victory in the race for Bastian’s open judicial seat to what might be termed a next-gen style of campaigning. Yang, who hired a field manager and deployed a phalanx of up to 20 volunteers at a time, did the standard lit drops and door-knocking familiar to judicial races through the campaign. But he also went new-school, hiring a media firm to shoot a series of 10- to 50-second video clips and boost their visibility on social media. Late in the campaign, Yang said, his team began using direct text messaging to potential voters all over Ramsey County. That too was done by paid consultants. “We could not have done that with just volunteers,” Yang said. Schultz and Kaardal agree that the two Yangs’ election victories might be a testament to the growing political clout of the Hmong community. Adam Yang agrees, but said it would have been impossible to win on votes from the Hmong community alone. He estimates there are between 10,000 and 20,000 registered Hmong voters in the county—not enough to win an election, but possibly enough to provide his margin of victory. If Adam Yang went new school, P. Paul Yang went old school in his bid to oust Atwal. According to his latest state Campaign Finance Board disclosure form filed on Oct. 29, P. Paul Yang spent about $34,000 on campaign fliers and postcards—many of them negatively blasting Atwal for his DWI record. 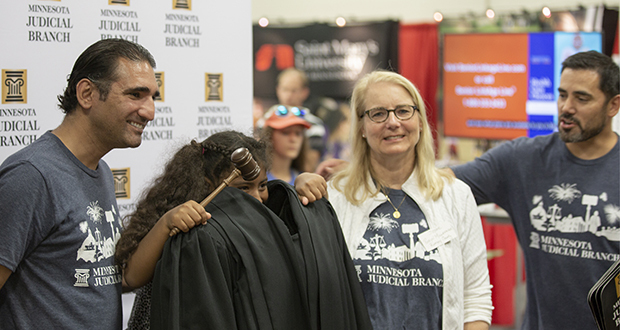 Schultz wonders if the two Yang victories might portend the emergence of sophisticated campaign tactics—and more sophisticated politics—in Minnesota judicial contests going forward. Again, Kaardal sees it differently.